Good evening from The Blundon Bourbon Review. 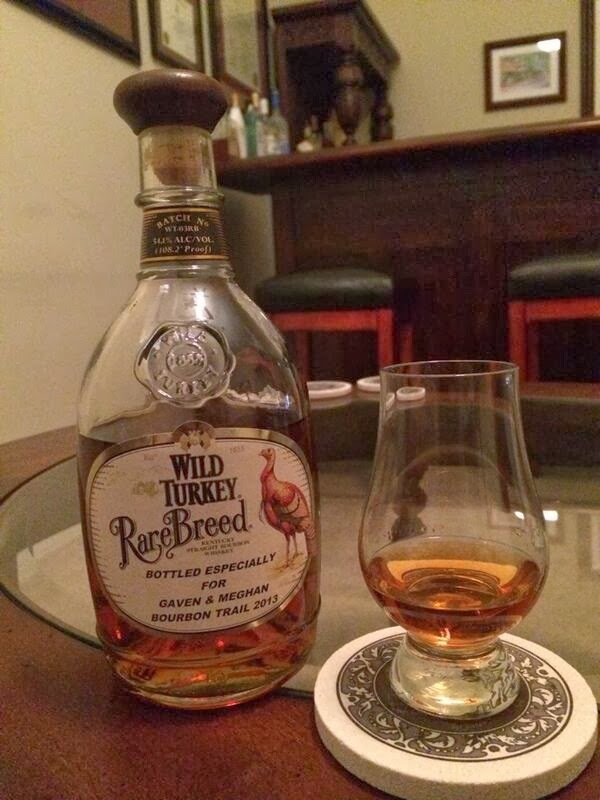 Tonight i'm happy to share with you my Wild Turkey Rare Breed bourbon review. WTRB is a combination of Wild Turkey 6, 8, and 12-year-old stocks which makes for a very smooth bourbon given the high ABV. Wild Turkey Rare Breed 108.2 proof and while this one was a gift from my brother-in-law during his recent trip to the bourbon trail (note the custom labeling for my wife and I), this bottle can be purchased for $40. Taste- (Neat from a Glencarin Glass) A wave of rye spice that is strong yet mellow, followed by defining notes of eggnog, mint, orange, cherries and tobacco. Finish- Long and spicy with a bitter tail. Simply yet bold. How I prefer my bourbon. Conclusion- Upon finishing my dram i'm left wanting another pour. The bitter finish is certainly present, however it is not overwhelming. For being rye heavy, WTRB is a great expression of a barrel proof (uncut with water) bourbon and, a great introduction to the higher proof products on the market. 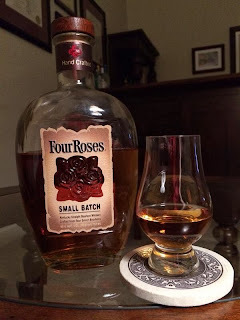 This is the first barrel proof reviewed on this blog and I look forward to diving deeper into the barrel proof market. 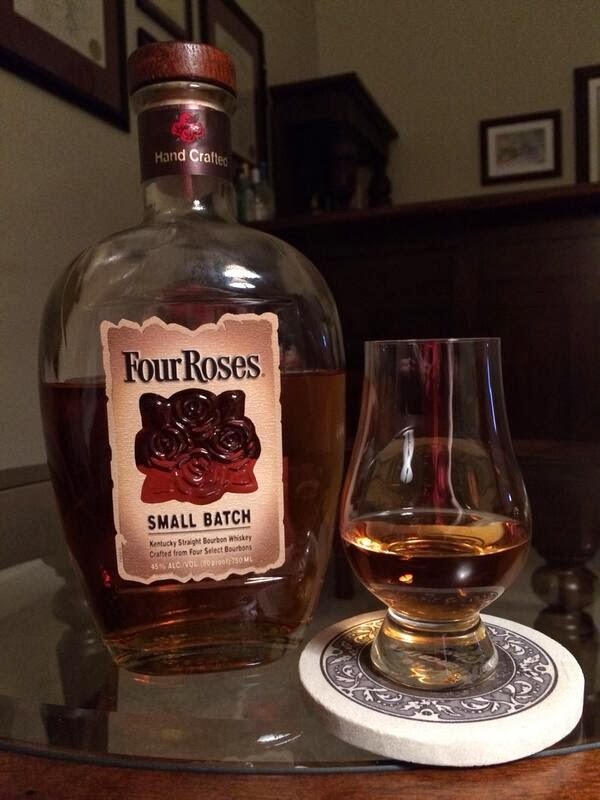 Four Roses Small Batch bourbon is produced by Four Roses Distillery, located in Lawrenceburg, Kentucky. Four Roses uses a variety of yeast strains and mash bill recipes to craft their award winning bourbons. Their Small Batch is bottled at 90 proof and can be purchased for ±$25. Nose: This initial aroma is very sweet with hard candies, fruits (cherries), vanilla and caramel. Spice quickly rises out of the glass with a heavy rye punch, clove, and cinnamon, and oak. Taste: (Neat from a Glencarin Glass) Black pepper, rye spice, Dr. Pepper, butterscotch, vanilla, cherries, and a bit of oak. Finish: Certainly one of the lightest bourbon I have ever tasted. The finish is medium in length with sweet fruits lingering at the tip of the palate and fading with mellow rye spice with oak. The flavors are all fairly subtle and fade out rather quickly. Conclusion: Let me start by saying that this is great bang for the buck. If you are a rye fan, this is the bourbon for you. Tons of spice; the bouquet of flavors really play off of each other nicely. That being said, there are alot of subtle flavors in the nose and taste, making it difficult to pin point them all. I would love to see this at a higher proof. Luckily for me (and you!) Four Roses releases limited barrel proof whiskys every year.